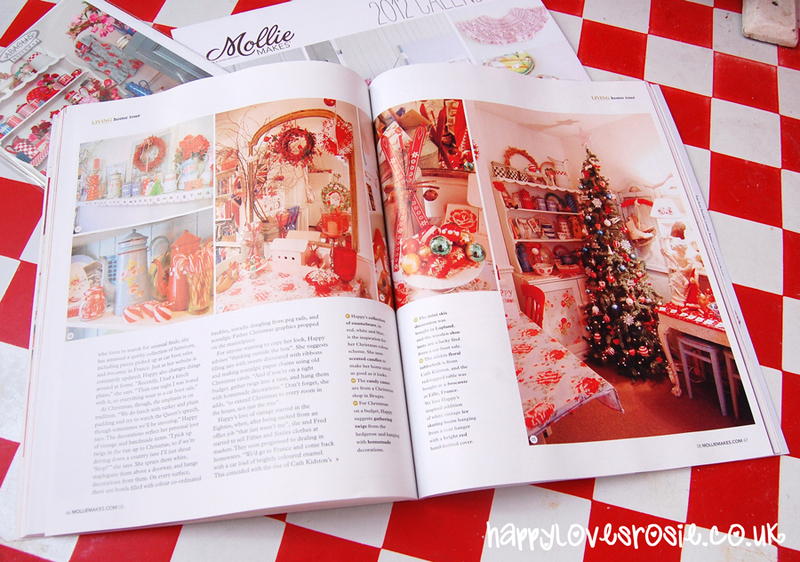 I am so proud and chuffed to be featured in this wonderful magazine’s Christmas Edition…(I have a 7 page spread!) 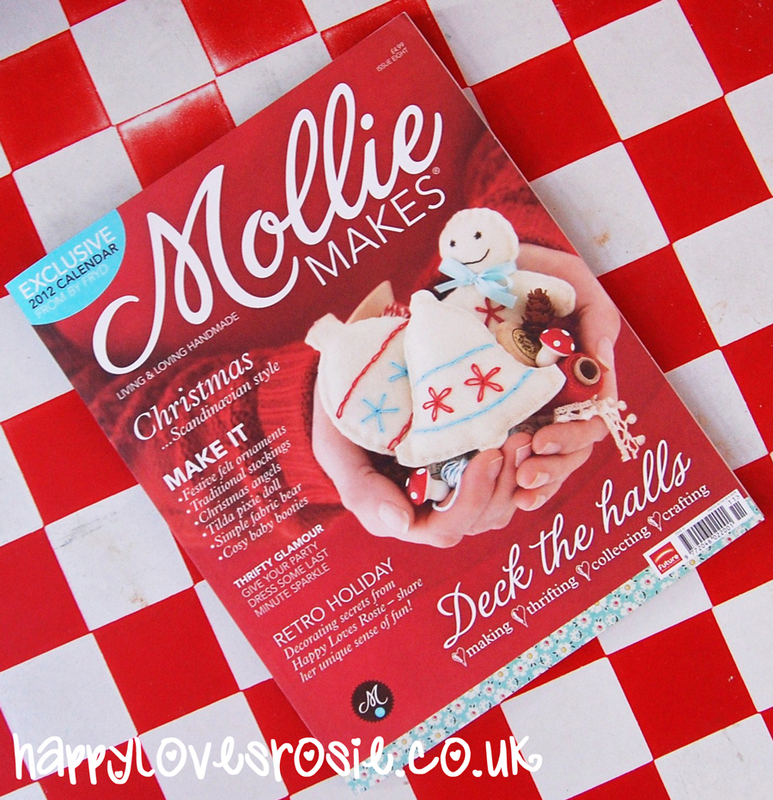 Mollie Makes was set up in July and since then has enjoyed a steady rise in sales and subscriptions…and that is because of one thing….its damn good! 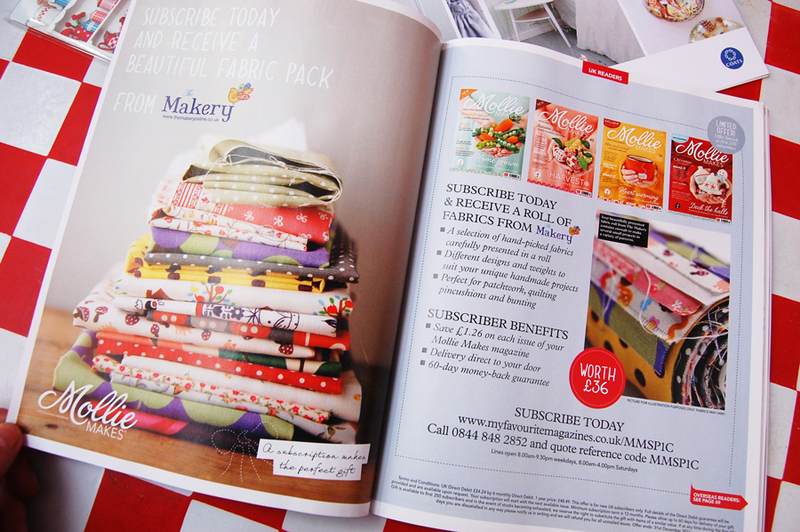 This is a craft magazine for the 21st century…A lot of gals and guys these days have brilliant talents and now with most of us having the internet and writing blogs, joining Etsy and Flickr…these are all mediums to show the world how creative we are…Mollie Makes encapsulates all of this into one magazine…and it is Brilliant…I totally take my hat off to the whole team ;). But also it has plenty of beautiful christmassy things to make and proper patterns and careful instructions that even the total beginner can follow….you will also recognise a few names from the craft book and blog scene…like in this Issue…Tilda showing you how to decorate your home with beautiful makes from her series of books…Oh and me! lol! Good Luck and have a fun weekend. Happy Easter Blog Banner Freebie! 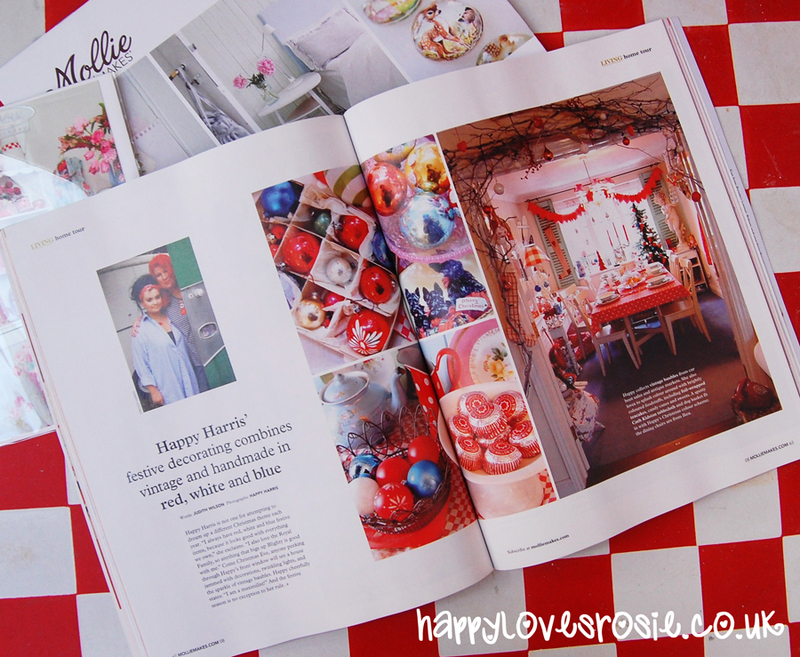 Next Post 15% off all Cath Kidston Products with Happy Loves Rosie TODAY ! My daughter wants a new bag – so I'm cutting out a 241 tote (Pattern from noodlehead) for her, I should get it finished for Christmas! I'm going to try a recipe from the book River Cottage Preserves for candied orange peel dipped in chocolate! – it looks yummy! Someone always gets a quilt from me. This year it's my granddaughter and one of my grandsons. Am also making little dolls with embroidered felt faces for my children in Sunday school. Happy, you must be busting buttons with pride from having your talent recognized by all these wonderful magazines! What do I like to make for Christmas? Well . . . besides fattening food, lol, I pretty much stick to paper crafts. That's what I enjoy the most! I love making cookies with my daughtr, gingerbread men and sugar cookies! Hard for me to find this magazine locally, so I'm thinking of subscribing! Thanks for the give away! This year I'm also making fabric gift bags to put the bottles of damson gin in!!! Just discovered your lovely blog and you are on my blog list! I try to make a home made gift with the kids for the grandparents. If I don't win, where can I order this mag? Living in Africa. . . I've also made damson gin – not all of it will be given away though! This year I am making crochet scarves & fingerless gloves as gifts for my girls. 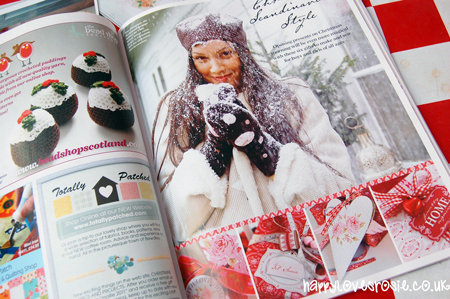 I would love to win the magazine with your fabulous feature in it. I enjoy making ornaments with my mom. We make them every year for shut ins at our church. Oh I bet that's a wonderful article on you. I would love to see it. Your decorating is so unique. Every Christmas I made something different, the last few years it's been felted and beaded ornaments like little cottages, a tree, a deer or polar bear. This year I realized enough of those so I must switch. I'm about to make some nice place mats this year. COOKIES+CANDIES ARE LOTS OF FUN TO MAKE FOR CHRISTMAS, BUT MEMORIES FOR EACH FAMILY MEMBER ARE THE SWEETEST! 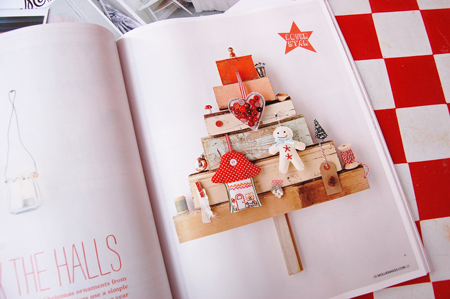 Paper decorations are a must for me…stars and baubles.Congrats on the article is looks great! Oh! Congratulations for the 7 page feature! What am I making this year? Well, dolls, as always and biscuits, because I'm translated to the USA and everyone makes cookies and little rabbits, because rabbits are for Christmas, right? I bought the mag' yesterday and noticed the feature straight away. Congratulations, you've got a lovely, creative home. I love making Christmas gift tags every year. Blog land got me hooked on them and now they're a tradition for my packages.